To date my absolute favorite activation we have ever taken part in is the birth of PAX AUS. This year PAX expanded their gaming convention overseas with PAX AUS taking place in Melbourne, Australia. This was a pilot project, on its maiden voyage and the response was massive. The show sold out almost instantaneously, and the expo halls were filled with excited faces. To say we were happy to provide a green screen photo booth for Magic the Gathering would be an understatement. Limelight’s team hit the skies for a 15 hour plane ride and began out excursion down under. 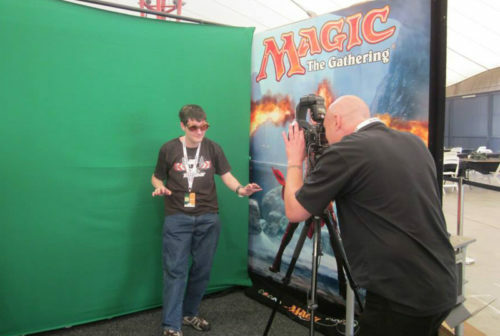 Our green screen photo booth was incorporated into the Magic the Gathering gaming booth. We provided the social media sharing platform for the Ignite Your Spark, cover photo contest promoting the newest Planeswalker, Chandra. Our Software PixPosure let the thousands of people who came through our booth have their picture taken and then they shared it with the world on their facebook pages. They were able to submit their image to the cover photo contest which entered them in a chance to win a FREE Trip to and PAX in the world. Sounds good to me! Each guest also got to keep a high quality instant 8×10 print of their photo op. We are super thankful to have been a part of the first ever PAX in Australia, and hope to find ourselves there again.